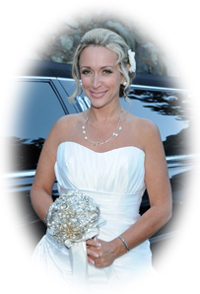 While searching for an extraordinary place to marry, you’ll find that there are many wedding venues in Northern Nevada and California worth considering. Narrowing the list to a select few, we describe three that are at the top of their class. In addition to attractive attributes and existence within unusual surroundings, each contains a sizable history that is especially interesting and distinctively noteworthy. The oldest permanent settlement in the state of Nevada is the thinly populated township of Genoa. Located in the center of this very small community is the Orchard House. Constructed in the 1860’s, it is now a Bed and Breakfast Inn founded by Carl and Hope Falcke, an establishment that is also geared towards hosting outdoor weddings and events. 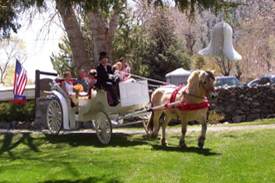 Tranquilly resting among the foothills of the scenic Sierra Nevada Mountain Range, the inn’s beautiful landscape is comprised of acreages of lawn and gardens intermingled with 100 year old shade and fruit trees. You’ll find the tone of the openness and solitude one of merit, and the many other subtle nuances will be quite convivial as well. The town of Genoa was originally named Mormon Station, but was renamed in 1855 by an elder of the Mormon Church, Orson Hyde. The name change came about after a trading post was constructed in 1851 that was built for the purpose of accommodating explorers during the territorial days, which eventually attracted permanent settlers to the area. Prior to that, the trappers and explorers would only briefly pass through. Although the Orchard House was unaffected, much of Genoa was destroyed by fire in 1910. The fire was started by an inmate in the county “poor house”. Also surviving the fire and just a few blocks from the inn was Nevada’s oldest saloon, which was patronized by Mark Twain, Ted Roosevelt, and John Wayne to name just a few. The “thirst parlor” is still currently in operation. The Orchard House to date has housed five generations of the Falcke family. 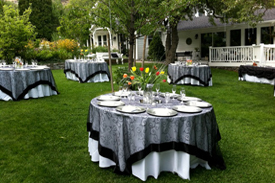 Strategically set at the base of the eastern slope of the Sierras just a short distance from Lake Tahoe, the serene setting composed with outstanding views is perfect for large, formal or informal weddings. Squaw Valley is home to one of the largest ski areas in the United States and was host to the Winter Olympics in 1960. One of the biggest luxury hotels in Squaw Valley is the distinguished Resort at Squaw Creek, an exceptional locale situated among the Sierra Nevada Mountains on the northwestern side of Lake Tahoe in California. The resort is in close proximity to Donner Pass, the infamous spot where the Donnor Party was stranded in 1846 on their fateful journey west into California. Snowfall can exceed as much as 40 feet during the wintertime in this area. 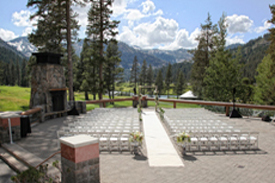 The Resort at Squaw Creek is an extravagant place that has several beautiful indoor and outdoor ceremony and reception locations. If you choose to have your wedding outdoors, you’ll find yourself engulfed with unmatched sights of the epic, mountainous terrain of Squaw Valley and striking ponderosa pines. With an ambiance of serenity and appeal, the resort will deliver an experience that is genuinely peerless. One of the most magnificent cathedrals in the west that’s comprised of unprecedented beauty is St. Mary in the Mountains Catholic Church. 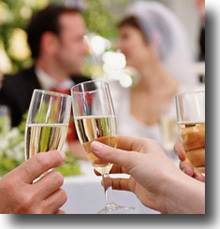 In combination with its remarkable design and historical past, this wedding venue is truly among the extraordinary. 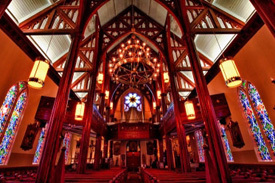 It is the oldest Catholic Church in Nevada and sits in the heart of Virginia City, a once vivacious silver and gold mining town of the mid 1800’s. This legendary city is presently a restored ghost town. 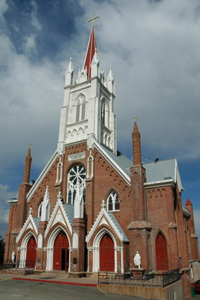 Originally built in 1860 during the Big Bonanza era in Virginia City, the church’s initial wooden creation collapsed. Its replacement met a similar destructive fate and was destroyed in 1875 by what is remembered as the Great Fire, which devastated much of Virginia City. Ensuing plans were soon underway to build a grander structure. 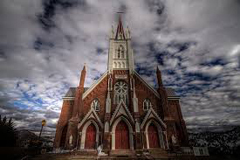 The successive church that stands today was built in 1876 and contains greater majesty than its predecessors, including a Gothic styled interior, an imported twenty-one foot alter, choir loft and galleries, an approximate 140 foot spire, and a huge church bell exceeding 2200 pounds. The church bell actually survived the fire, originally being part of the former church. From the historical context alone, this site is an exceedingly unusual place, and if seeking to marry in such a location, it would especially present an atypical experience. 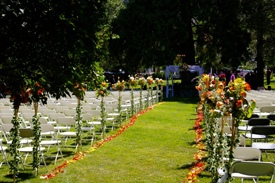 Embodied with an enriching past of Old West caliber, St. Mary in the Mountains is categorically an inviting venue for brides and grooms looking to have a unique and sanctified wedding. With an assortment of wedding venues at one’s disposal throughout Northern Nevada and California, it’s a sure bet that the Orchard House, the Resort at Squaw Creek, and St. Mary in the Mountains will rank among the elite. 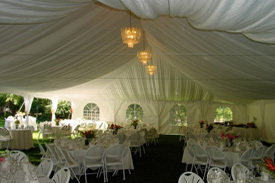 The contrasting elements they possess in comparison combined with their diverse historical background will produce an ambiance solely unto itself, and choosing to marry at any one of these phenomenal wedding venues will conclusively produce a stirring day, one that will be long remembered and in a very special way.